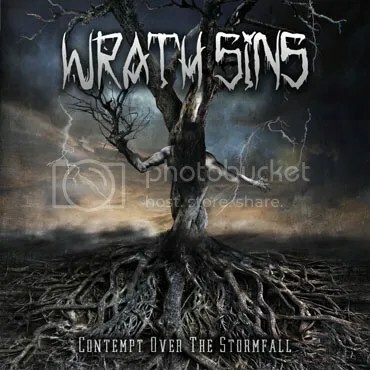 Wrath Sins picked up the classic thrash metal, filtered the edginess with some prog and “Contempt Over The Stormfall” was born. It’s not exactly modern thrash metal; it’s thrash metal with a polished twist. In the mix there’s also a graver tone of vocals, unlike the high pitches this genre has gotten us used to. It’s still clean and aggressive, like Bobby Blitz or Chuck Billy’s, but a notch lower than theirs. And then there’s the growling backing vocals, functioning as a spicy seasoning. Still they invited some “legends” of their hometown underground to enrich the outcome – Fernando Martins of Web sings in the straightforward “Textured Vengeance” while Miguel Inglês of Equaleft helps out in the groovy (what else?) “Solipsism”. Musically/instrumentally speaking, “Contempt Over The Stormfall” is a pretty consistent, solid album, featuring beefy riffs (the title-track, ”To Where The Waves Break”) and classy guitar pieces (my favorite “Watching Time Collapse”, or “Paradox”). Well done, boys. This entry was posted on 6th January 2016 at 9:40 pm and is filed under CD, Metal, Uncategorized with tags contempt over the stormfall, Debut album, Metal, Raising Legends, Thrash metal, Wrath Sins. You can follow any responses to this entry through the RSS 2.0 feed. You can leave a response, or trackback from your own site.